The Lord said to Moshe and Aaron: This is the law of the Passover offering: No foreigner shall eat of it. But any slave a man has bought may eat of it once he has been circumcised. No bound or hired laborer shall eat of it. It shall be eaten in one house: you shall not take any of the flesh outside the house; nor shall you break a bone of it. The whole community of Israel shall offer it. (Exodus 12:43-47). Clearly this commandment is connected to the general commandment to remember the miracles of Egypt. At most basic level we learn who gets to eat of the Passover sacrifice. This action very clearly helps us define the group and who is a part of our nation. But still what is the problem of breaking the bones? This argument suggests that breaking the bones on any day would be beneath us, but on Passover when we are reenacting our liberation and lounging ( leaning) as kings, we should not gnaw at bones like slaves. It seems that there is still more going on with this commandment. I was thinking about this question a few months ago while reading up on my Norse mythology. At the time I was preparing to take my boys to see Thor: Ragnarok . 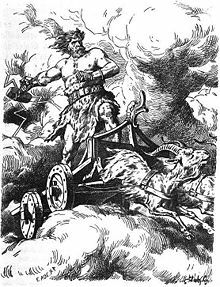 As I learned Thor‘s chariot was pulled by two goats Tanngrisnir ( snarler) and Tanngnjóstr (teeth grinder). When Thor was hungry, as he had an epic appetite, he would kill and cook the goats. After eating them Thor resurrected them with his hammer and they would be brought back to life the next day. Once while on one of their many adventures Thor and Loki stayed a night at the home of peasant farmers. Thor invited them to share with them his goat meal. Despite Thor’s warning against it, Loki suggests to the son of the farmer that he should taste of the goat marrow because it will make him like a god. Sure enough the mortal follows the suggestion of the trickster and breaks one of the bones to taste of the divine marrow. When Thor resurrects the goats the next morning, he finds that one of the goats is lame and becomes enraged. As a result, Thor maintains the farmer’s son and his sister as his servants and join Thor and Loki on their adventures. While I know that a lamb is not a goat, there is something interesting here between these two narratives. Many believe that the lamb was a god to the Egyptians. The act of sacrificing the Egyptian god was itself an act of defiance and demonstrated the Israelite commitment to leave and not return. In light of this story of Tanngrisnir and Tanngnjóstr, maybe the prohibition of breaking the bones is not that we are like dogs gnawing on bones. Maybe the prohibition is meant to stop us from listening to Loki the trickster. We might mistakenly think that we could become gods and ultimately just become servants. Our tradition is full of commandments that help us preserve the memory of our exodus from Egypt. I believe this prohibition to breaking the bones of the Passover sacrifice is to teach us humility. It is to remind us that this is a story of our liberation not our apotheosis. On the Second day of Rosh HaShana we read arguably the most central texts to Jewish life, the story of the test of Avraham. As we read God commands Avraham to sacrifice his son on Mount Moriah in Jerusalem. Isaac is bound and placed on the altar, and Avraham raises the knife to slaughter his son. A voice from heaven calls to stop him, saying that it was a test; a ram, caught in the undergrowth by its horns, is offered in Isaac’s place. The Bible doesn’t specify how old Isaac was at the time of event. One clue to his age is when Isaac notices wood and fire but, seeing no animal, asks Avraham about it (Genesis 22:7). This implies that Isaac is at least old enough to know what the proper sacrificial process is and perceptive enough to ask his father about it. From the chronology of Sarah’s life we learn that the oldest he could have been was 36 or 37 when he was offered as a sacrifice (Sanhedrin 89b and Genesis Rabbah 56:8). So, Isaac was certainly not an older man when he was to be offered as a sacrifice, but neither was he a toddler. Probably the most useful clue to how old Isaac was their climb up the mountain. Isaac is the one carrying the large pile of wood (Genesis 22:6). This fact tells us Isaac wasn’t a small child when he was to be sacrificed; he was at least a healthy teenager. What is invested in the age of Isaac? If he was strong enough to carry the wood up the mountain, then he was probably physically and mentally strong enough to resist being sacrificed. The fact that Isaac allowed himself to be bound and placed on the altar shows that Isaac continued to trust his father. I was thinking about this question recently while reading up on my Norse mythology. And yes I was preparing to take my boys to see Thor: Ragnarok which is coming out in theaters soon. I read the story of Fenrir the monstrous wolf who is foretold to kill the god Odin during the events of Ragnarök. As the story goes Odin foresees that Fenrir will kill him so he gets the gods to capture him in hopes of saving himself. The gods plan is to control Fenrir to preempt his destroying the world by binding him in chains. Like a virile teenager Fenrir enjoys the challenge and is happy to prove his growing strength in breaking their chains. Eventually they produce Gleipnir, a magical slender unbreakable silken strip. Even though he wants to prove his strength Fenrir is no fool and does not trust them. He concedes to be bound as long as one of them will place their hand in his mouth. Everyone refused to place their hand in Fenrir’s mouth until Týr put out his right hand and placed it into the wolf’s jaws. They bind him and like the wolf from Peter and the Wolf the more Fenrir kicked, Gleipnir caught tightly, and the more Fenrir struggled, the stronger the band grew. At this, everyone laughed, except Týr, who there lost his right hand. Why does Fenrir want to be bound to prove his strength? Fenrir is driven by pride and glory. Like a teen Fenrir needs to test his limits to understand himself. This growing power is exactly what the other gods fear in him and leads to his tragic capture. Ultimately he is limited by his drive for success. And while the gods do this for self-protection, it is not without a price. Coming back to this test of Avraham the story of Fenrir is a fascinating foil. First of all it is not ever called the test of Avraham, but rather the Akedah, the binding of Isaac. If in fact he is not a young lad at the time of his binding, it is easy to see him as a teen. What is Isaac proving by carrying the wood, let alone being complicit his binding, getting on the alter, and almost sacrifice? Isaac is seeking to push his limits and understand the limits of his own body and his relationship with his father. And what does the binding of a 37-year-old man mean? Like Fenrir does Isaac have something to prove? We never see Avraham and Isaac interact again after the Akedah. Might their relationship be severed like Týr’s right hand? Coming back to Rosh HaShana the story of Fenrir is also a fascinating foil. What drives us to success? Might these traits that help us grow and strive for more also limit our success? In what ways are we heroic or tragic in proving we can deal with being bound? May we all find a way to be unbound this coming year. Shana Tova.